If you're looking for some color pop this spring season this style comes in a variety of pop shades. The heel is comfy for long walks, the style looks gorgeous with pretty dresses and fabulous trendy jeans. Fun colors to play around with are citron, floral and mauve suede. 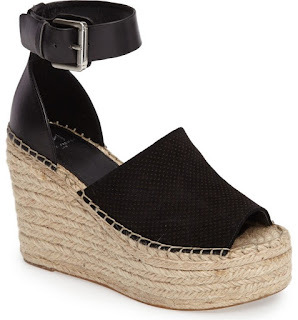 Every woman loves a good wedge shoe that they can rock for the spring and during vacation season. This styles comes in three shades black, tan and a soft blush. These are great signature shoes that can be transitional for the summer season. The ankle strap gives it more of a structure style. Trying to find that perfect spring shoe for your 9-5 these are super chic and glam. I love the color so feminine and flirty. The additional tie in the front makes it that attention seeker with a posh shade in a pedicure. It also has the perfect height in a heel size so no foot pain for a long day. Strappy sandals for glam nights out are all about this style! I love the tie up trend it gives your legs that extra accessory statement. It also has the fun tassle/fringe trend that can be tied in the front or back. These are great for dressing up for special occasions. I love shoes that are unique in style and these prove to be one that I am feeling. The color combinations are so fierce it allows you to play around with array of shades for spring and summer. Wonderful for midi skirts, ruffle dresses and a-line styles. Want more styles in trends check out our boutique as well GlitterBuzzStyle Boutique.